Facebook’s efforts to tackle misinformation, promote online safety in Sri Lanka and boost digital literacy skills were among several topics debated at a fireside chat on Saturday, held as a part of the Fairway Galle Literary Festival 2019. 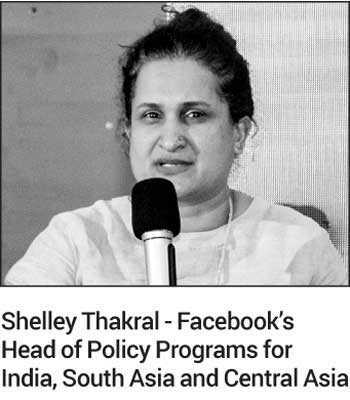 Speaking to an audience of authors, professionals, academics and journalists, Facebook’s Head of Policy Programs for India, South Asia and Central Asia Shelley Thakral, took the opportunity to outline the steps Facebook has taken to tackle misinformation, as well as reiterating its commitment to continued progress. “We take misuse of our platform incredibly seriously and are committed to fighting misinformation and hate speech on the platform in Sri Lanka with the same energy and effort that we are demonstrating globally,” said Thakral. Facebook is a very popular social platform in the country with over 6.2 million people using it every month. Some of the programs that Facebook is scaling up in Sri Lanka are those aimed at promoting digital literacy and economic development in partnership with civil society organisations and local community groups. These initiatives include a digital literacy program run in conjunction with Sarvodaya, one of the oldest civil society organisations in Sri Lanka, to train up to 20,000 school children by the end of 2019 on how to engage on social media safely. Facebook has already trained more than 11,000 people, reaching more than 1200 villages across Sri Lanka. A similar program called Smart Social Circles is operating in collaboration with the country’s Information Communication Technology Agency to enhance connectivity within a Grama Niladhari Division and empower citizens through the effective use of digital technologies and ethical use of social media. At the same time, Facebook has supported Boost Your Business programs in Colombo to support local economic development, with more to follow in Kandy and Galle later this year. Its #SheMeansBusiness program was launched in Jaffna in 2018 encouraging aspiring women entrepreneurs to take their businesses online. This year, Facebook is planning to take the program to Kandy, Galle, Polonnaruwa and Kalutara.